I got this great recipe from The Recipe Girl. She has a lot of wonderful recipes on her blog. You should definitely check her out. I was looking for something super fast and easy. This was the perfect recipe. Everyone enjoyed it and asked for the recipe. They were suprised to find out it was only dressed up ice cream sandwiches. I cut the recipe in half since there wasn't a lot of us and it was just enough. 1. Spray pan with cooking spray. Layer 12 ice cream sandwiches side-by-side in bottom of pan. 2. Spread one tub of Cool Whip over the top of the sandwiches. Drizzle caramel and chocolate syrups over the top of the Cool Whip and then sprinkle with toffee bits. Place in the freezer for about an hour. 3. 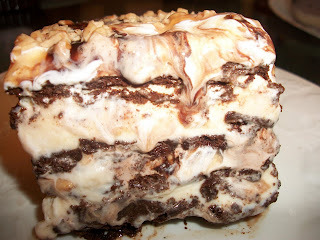 Layer 2nd level of 12 ice cream sandwiches on top of the toffee bits. Spread with 2nd tub of Cool Whip. 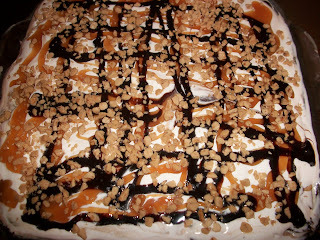 Drizzle caramel and chocolate syrup over the Cool Whip. Sprinkle Skor/Heath bars over the top. Place in freezer for several hours until firm. 4. When ready to serve, remove from freezer and use sharp knife to cut into squares. I LOVE this recipe! It looks like you spent forever on it, but it is so easy to make. Delicious. This looks and sounds incredibly delicious. I am so bookarking this to try.